HSBC is to keep its headquarters in the UK after a 10-month review during which time the government has made a series of changes regarded as favourable to the bank. After the May 2015 Conservative election victory the chancellor, George Osborne, has backed away from creating rules intended to toughen up the regime for holding senior bankers to account. He had said he would reverse the burden of proof but has reverted to the more usual system of bankers guilt having to be proven. He also changed the system for taxing banks. A bank levy on balance sheets, which hit HSBC hardest of all the banks, is being scaled back and an eight percentage point corporation tax surcharge on profits is regarded as hitting its smaller rivals harder. Analysts have calculated that the changes mean HSBC will pay £300m to the exchequer – down from £1bn under the previous bank levy system. 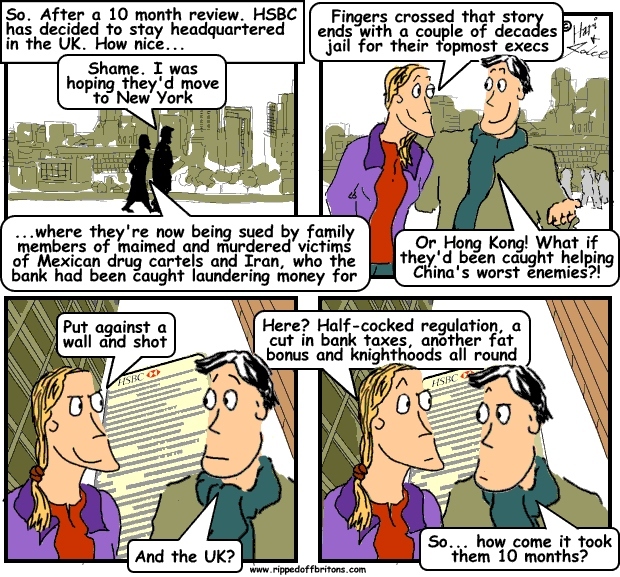 Families of U.S. citizens murdered by drug gangs in Mexico have sued HSBC, claiming the bank can be held responsible for the deaths because it let cartels launder billions of dollars to operate their businesses. The lawsuit brings fresh scrutiny to the Mexican activities of HSBC, which in 2012 paid $1.9 billion to resolve a criminal investigation into whether it violated U.S. sanctions laws and laundered at least $881 million on behalf of drug cartels. The new case recounts a series of murders in 2010 and 2011 in horrific detail, arguing that the bank should be held to account for them under the U.S. Anti-Terrorism Act. Lesley Redelfs was four months pregnant when she and her husband, Arthur, were shot by the Juarez cartel after leaving a children’s birthday party hosted by the U.S. Consulate in Ciudad Juarez, where she worked. Jaime Zapata and Victor Avila Jr. were special agents for Immigration and Customs Enforcement, driving to Mexico City when they were run off the road by two vehicles filled with hit men from the Los Zetas cartel, who then opened fire. Avila survived. Rafael Morales Jr. was abducted on his wedding day, as were his brother and uncle, and the three died of asphyxiation after members of the Sinaloa cartel wrapped duct tape around their heads. HSBC already is among banks facing a lawsuit from families of U.S. soldiers killed or injured by attacks in Iraq on accusations that the firms helped Iran process transfers and finance Hezbollah and other militant groups.